Have you ever wanted a 16V head on your X engine? Discussion in 'Discussion Forum' started by rjplenter, Nov 30, 2015. It doesn't belong to me and it is missing one rod and the oil pan. I think the X19 oil pan will fit it, haven't tried that yet. It was a running engine when the PO took it apart, I am trying to get that last few parts from him. It bolts up to the X19 transaxle but the nose mount would have to be fabricated. It is a 1600 and I suspect, but not certain, that the 1900 crank will fit it like the Tipo motor. Only down side is that it has hydraulic lifters but there are after market cams for it. You can fit an X1/9 snail mount to the Brava/Stilo block with a bit of effort. One original threaded hole for the snail is still there on the late block! However you need to drill and tap the block for the other two bolts and rearrange the cam belt idlers/tensioners to clear the snail. Alternatively you can fabricate a nose mount to fit where the Stilo mount goes. Take your pick! Charlie an X1/9 oil pan (sump) fits no problem. We re-routed the cam belt so I didn't need to remove the snail mount to change a belt. Pretty straight forward - although we had to fabricate a new tensioner so the belt tension was OK. And it only JUST fits. We were a touch concerned about the span between the camwheel and crank - but havent had any issue and the belt doesn't flap to any degree. So what is the intake side of this engine look like? Are there a coupla Weber's sitting next to you inside the cabin? Even better - I'm not big on carbys! unless I'm mistake, what you did was a swap with an entire 16v engine, right? "To incorporate the extra oil-return-paths and symmetrical head (as opposed to the asymmetrical SOHC head) the cylinder-block was slightly revised making the DOHC head non-interchangeable with the previous incarnations of the 128 engine." What I don't understand in the whole 16V story is this: our dear friend Aurelio Lampredi designed the Fiat twin cam engine back in 1966. He later designed our trusty Fiat SOHC in 1969 (?). Many years later, FIAT commissioned GM (who were partners) to design the Torque 16V evolution of Lampredi's SOHC engine. Why evolve a Lampredi SOHC into a DOHC when the man designed a perfectly good DOHC in the first place? Tony I must say that you are a man of blunt and to the point words. However the reply was very close to your assumption and I must laugh at the simplicity of the resulting product. Who needs a radio when those for barrels are singing. Dom you are correct in what you say. I did use the 16v block because when we looked at the 16v head to 8v block scenario we felt nauseous! There is a LOT and I mean LOT of work required. 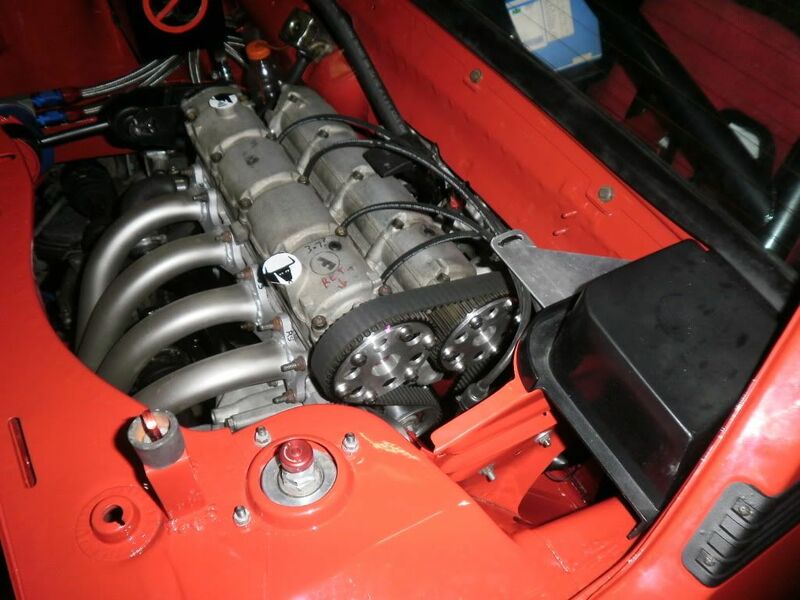 What I did though was use the 63.9mm crank as the Fiat Nationals category at the time was UPTO 1500cc and using the original brava/tipo crank would have had me at 1581cc - and in the same category as the 1608/1756/1995 Twin Cams - several of them pushing over 260bhp with 16v heads! The irony is that after all that work to stay under 1500 they changed the categories to be under 1600.... so I needn't have done anything.... that's motorsport I guess! There is one massive advantage of the Torque16v over the "traditional" Lampredi TC and its something that is seldom discussed - I suspect because not many people have worked it out - and those that do don't want everyone to know. The Torque16v is actually quite a bit LIGHTER than the Lampredi - and on top of that using the Torque16v means you can use a X19/128 gearbox rather than the Lancia Beta/Croma one. The net result is a touch over 40kg saved. And in racing terms that's massive - especially as the X1/9 is rear heavy and adding weight back there is a hard thing to redress without ballasting the front. No doubt this was also a factor in the 90's FWD applications for this motor. Brava/Bravo/Multipla etc. There are negatives though. The aforementioned hydraulic followers is probably the biggest. Conversion to solid lifters is a big job because the camboxes are 1 piece and there is no way to check tappet to cam clearance without a lot of modifications. 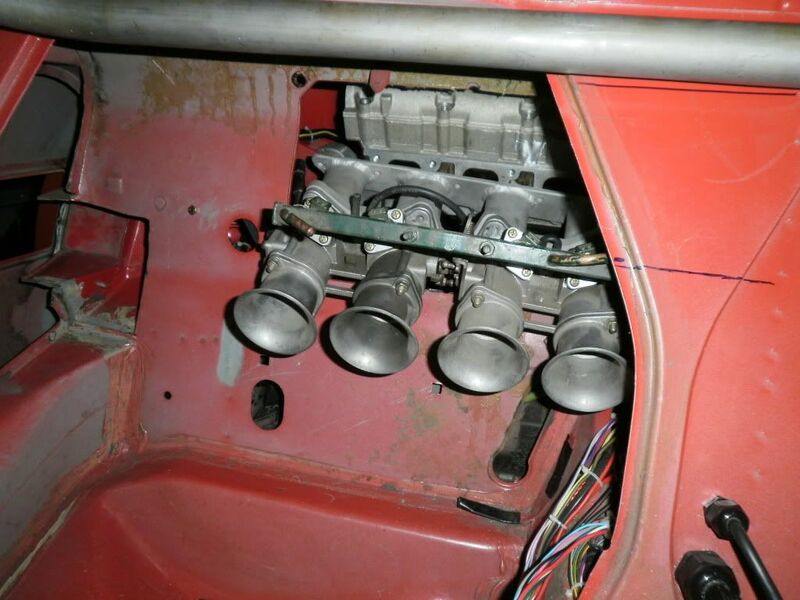 The standard oil pump in a 1581 16v was from the 1581 Tipo 8v - and it isn't upto the job of feeding the same engine PLUS 4 piston squirters and 16 leaky lifters. This is why most of the 1581 16v road cars you hear sound rattly. We basically had no choice but to fabricate a new oil pump. The other thing is poor head design. Not that its actually that bad - just that it is much more suited to a "shopping trolley" small family hatchback than a racecar. The intake valves and ports are the same size on both sides of the engine. In fact you often see these engines running "reverse port" to make packaging easier. Basically if you can sort out the cams and bolt the exhaust manifold to the intake side of the head and vice versa you're in business. My head guy did SIGNIFICANT work on the intake side of the head to make some decent flow figures. There are a few weak points too - befitting this engine's "economy car" status. The main one is the threaded holes in the head for the camboxes. They seem to hold for 2 tightenings and then strip the threads out. Anyone working on these engines should helicoil (thread insert) those holes at first opportunity. Very interesting info - thanks Dave! I was doing a 1.9 sohc turbo for my Dallara rep. I bought a Stilo 1.6 16V engine to rob its crank, but when I looked at the complete engine I wondered why I shouldn't have a 1.9 dohc turbo engine using the "Stroker Turbo" Wossner pistons I had got for the sohc. I couldn't see a problem with that as the pistons are very dished so valve cutouts are probably not needed (EDIT - they have NO flycuts for the sohc's two valves). 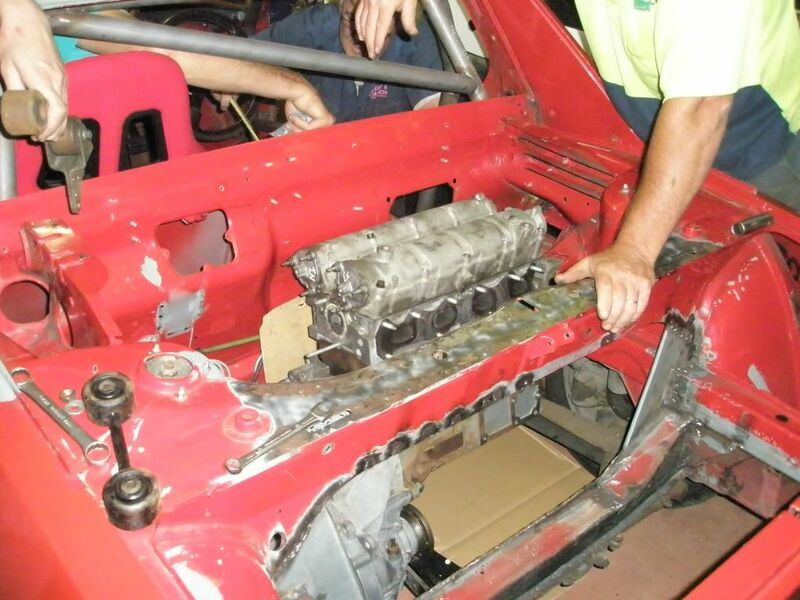 I should add that the 1.9 dohc would need an 86.4 mm bore Brava block as the base to do this. I investigated fitting the snail mount and rearranging the cam belt so it could be changed without removing the snail, exactly as you have done. My solution was to replace the "auto" tensioner with a sohc eccentric type tensioner pulley, and replace the large inlet side idler pulley with a smaller pulley from a VAG TDI motor. This allowed me to keep the stock cam belt. Do you think it's worthwhile pursuing the 1.9 dohc turbo route? I have no cubic capacity constraints as my car is only a hobby! Sure! Why not? I'm not sure if any modification is required to fit the ultra-long crank - but on paper at least it makes perfect sense. I'm not a turbo fan - but I would think that using positive pressure would somewhat mitigate the poor intake side head design. The standard cams (that will keep the lifters in-check) will probably satisfy you with forced induction too. One area that you are going to seriously need to think about though is that oil pump. Its already marginal (or worse) If you are feeding oil to a turbo as well I think you will run into issues. You will be making big torque numbers too - I suspect the gearbox/diff is going to need some consideration? I run a Bacci diff and its been great. I did break a standard 3rd gear though, and I NEVER do burnouts or give the gearbox a hard time off launches. I now run a Bacci close ratio gearset (a whole new thread unto itself!). I would have to check but I suspect they are different castings, mirroring the 80.5 and 86 bore block differences in the sohc family. I guess you need my 80.5 Stilo block! I'm surprised the dohc has the same size inlet and exhaust valves, I guess it does give packaging flexibility but must limit the potential of the engine. For me I would not be going mad with boost, and I use Punto GT gearboxes that are reasonably robust. absolutely stunning and appropriate for this car with no doubt. Its clearly obvious that most manufacturers utilize an asymmetrical arrangement purely for packaging as they MUST know that the cross-flow head is just gonna work better. Alas... with all the work required to install an engine that is "correct"... with an appropriate amount of horsepower to really make this a killer sports car... it makes dropping in a 240 hp K20 look like a breeze. ...this has generated a much more interesting discussion than I had imagined. Really enjoying hearing about and seeing (Racheal, do you have photos?) what people have done. I only did this as a feasibility study, nothing implemented yet! Interesting! Certainly looks like it would work. I've looked and can't find any good photos - but mine makes do without the 2nd tensioner - however uses a much larger diameter on the original one. Instead of the modern style tensioner as you have there I used the standard X1/9 mount and the "lipstick" tensioner assembly.